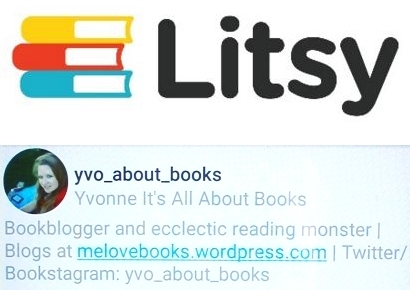 I have been trying to write this review ever since I finished buddy reading The 7 Deaths Of Evelyn Hardcastle with Nicki @ Secret Library last weekend… But somehow I can’t seem to get a word on paper without either sounding like a raving fangirl or a blubbering mess. But I can’t NOT scream my love for this absolute masterpiece from the rooftops, so here is my attempt at writing a somewhat coherent review. Let’s start with another metaphor: even days after reaching the final page of a new all-time-favorite, I’m still picking up the pieces of my mindblown brain. The 7 Deaths Of Evelyn Hardcastle is unlike anything I’ve ever read before, and I have read my share of mystery/thrillers during my time on this planet. The plot is highly intricate and extremely well constructed with plot twists within plot twists not unlike a Russian doll. Each time you think you start figuring out the truth a new layer is discovered, leaving you both flabbergasted and wondering how this new information fits in the general story. I think The 7 Deaths Of Evelyn Hardcastle is one of the few books where the repetition of the same day over and over again actually enhances the plot considerably. Repetition you say? Isn’t that only supposed to slow don’t the pace and make you less invested in the plot? Think again. It seems like complicated and powerful magic and I bow to the writing skills of Stuart Turton, but there is no doubt this book is hands down one of the best debuts I’ve read to this date. Never has the phrase ‘had me guessing until the very last page’ been more true! I won’t be tiring of recommending this book to everyone I know. Brilliant. Mindblowing. Flabbergasting. Extremely well executed. And overall 200% worth your time. There is one thing for sure: Evelyn Hardcastle will die, murdered at 11:00 P.M. Evelyn in fact will die over and over again until Aiden Bishop can identify her killer and break the cycle. He has eight days and eight witnesses to inhabit to do so, Aiden waking up in the body of a different guest every time the day starts anew. Not every host is as helpful though… And with nothing being as it seems, Aiden’s task might be almost impossible. Claiming that The 7 Deaths Of Evelyn Hardcastle is absolutely brilliant and a true masterpiece might just be an understatement… I’m not sure how to properly describe my feelings for this book other than the phrase ‘just read the damn book‘, because that actually seems like the right thing to say here. Yes, this debut is THAT good, as you might have guessed from all the other (and most definitely more proper) reviews out there… What are you waiting for? My only complaint would be that this book might have ruined any future books of the same genre for me… How on earth can they still be satisfying after The 7 Deaths Of Evelyn Hardcastle has raised the bar that high? I always love rereading Harry Potter, and book number three is one of my favorites of the bunch. I started my reread in Spanish some time ago and The Prisoner Of Azkaban was up next; it fitted one of the prompts for the Magical Readathon perfectly so it was an easy choice. It was so great rereading this one again! It’s always great rediscovering little details I had completely forgotten about. If you enjoy reading non fiction historical texts and have an interest in the Second World War, The Tango War will without doubt interest you. It’s not the fastest read of the world and the essay-like chapters might slow you down, but this book shines the light upon a wide variety of topics related to the role of Latin America during the war. Would I have liked to see a more neutral point of view instead of a clearly US influenced perspective? Maybe. Would I have liked to see more of Latin America itself? Probably. But there is no doubt The Tango War is still a little goldmine of information. After Ali mentioned this book in one of her posts, I had no other choice but to stop procrastinating and start reading Every Heart A Doorway. I’ve been wanting to read this story ever since I first heard about it, and it looks like first impressions sometimes really hit the right spot. What a wonderful wonderful read! My only complaint would be that I wish the story would have been longer, because there is so much to love and only a limited amount of pages to do so. This was a buddy read with Nicki @ Secret Library… We’ve been taking things slow as to fully savour this little masterpiece. WHAT A BOOK!! 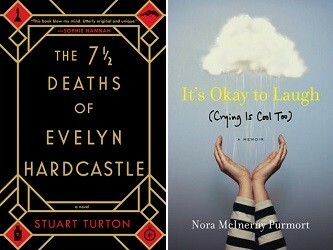 Claiming that The 7 Deaths Of Evelyn Hardcastle is absolutely brilliant and a true masterpiece might just be an understatement… I’m not sure how to properly describe my feelings for this book other than the phrase ‘just read the damn book‘, because that actually seems like the right thing to say here. Yes, this debut is THAT good, as you might have guessed from all the other (and most definitely more proper) reviews out there… What are you waiting for? My only complaint would be that this book might have ruined any future books of the same genre for me… How on earth can they still be satisfying after The 7 Deaths Of Evelyn Hardcastle has raised the bar that high? If you are looking for something different to read, don’t mind disturbing the dead and enjoy a well developed historical setting and a strong main character, The Impossible Girl is just the book for you. The perfect balance of a strong historical setting, a dose of creepy, a mystery, some violence and romance makes this story work like a charm. It was interesting to see the story and the characters evolve and I had a great time reading this one. I’m trying to read the books for the Magical Readathon in time, so I need to pick up Uprooted by Naomi Novik ASAP (I don’t care about Divination, so I’m probably not picking up that title). I also need to read the ARC Truth And Lies by Caroline Mitchell and The Confession by Jo Spain some time soon since the publish date is coming up. My newest TBR jar pick is still An Officer And A Spy by Robert Harris. I’m still buddy reading The 7 Deaths Of Evelyn Hardcastle by Stuart Turton with Nicki @ Secret Library… We’ve been taking things slow as to fully savour this little masterpiece… WHAT A BOOK!! This is definitely going to appear on my list of 2018 favorites. 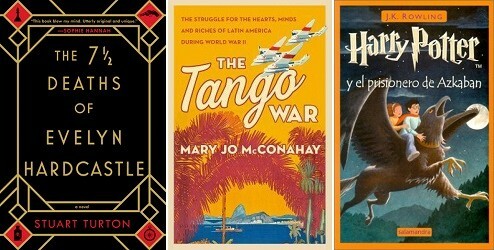 I’ve also picked up The Tango War by Mary Jo McConahay, a non fiction WWII book about the role of Latin America in WWII. I’m not really far into it, but so far it’s interesting. And last but not least, I’ve started another Spanish reread of the Harry Potter series! The third book is one of my favorites and I’m looking forward to spend more time with Sirius and Lupin. Harry Potter Y El Prisionero De Azkaban it is! I like reading memoirs every once in a while and when I saw It’s Okay To Laugh being compared to the memoirs of Jenny Lawson, I just HAD to get a copy. Fierce and hysterically funny? Sign me up for that! Sadly, I’m feeling kind of cheated now I have picked it up… Because there is no way It’s Okay To Laugh bares any similarities with the work of that author. Both the writing style and tone were just off for me, and it felt rather repetitive and almost nagging to me. If you like science fiction, are looking for something different and don’t mind repetition in the plot, you will probably enjoy The Echo Room a lot better than I did. I still really like the idea behind this story, but unfortunately I wasn’t able to enjoy actually reading it. 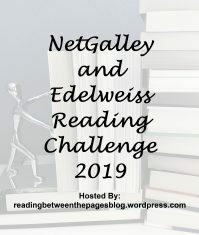 Between the lack of crucial information, repetitive chapters and lack of connection to the story and characters I had a hard time making it to the final page, although things did improve later on. The story was just too strange and vague for me… But like I said before, the problem might just have been me. Britt-Marie Was Here is already the fourth book I’ve picked up, and this story has only reconfirmed my love for his stories. Fredrik Backman is a true master in creating unique and flawed characters that you cannot help falling in love with. It was so great seeing more of Britt-Marie! Basically, I loved every single minute of this book, and while nothing can beat Ove, both My Grandmother Asked Me To Tell You She’s Sorry and Britt-Marie Was Here currently share a second place on my list of Backman favorites. I admit I wasn’t completely convinced by the first book when I read it last year, mostly because the whole just felt a bit too chaotic and too many different elements trying to be squeezed into one story. 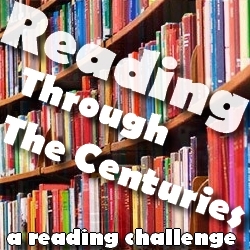 I picked up the sequel anyway, both because I was curious to see how things would continue and because it fitted the Magical Readathon challenge… While things did improve and the story seemed to be more coherent, I still wish more focus would have been on the Library. There is a lot going on, we have werewolves, dragons, fae and magic, the story is partly set in Venice… But somehow the spark is missing? The whole thing actually felt a bit dull and rather slow-paced for a story about magical creatures and a plot to start a war that might destroy an alternate world or two. As I’m still reading Evelyn Hardcastle, I’ve been posponing other thriller read as to not confuse the two plots. 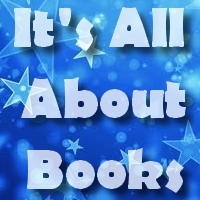 I’m hoping to pick up the NG ARCs The Confession by Jo Spain and Truth And Lies by Caroline Mitchell some time soon though, because the publish dates are coming closer… I also need to read the ARC The Impossible Girl by Lydia Kang soon. My newest TBR jar pick is still An Officer And A Spy by Robert Harris. 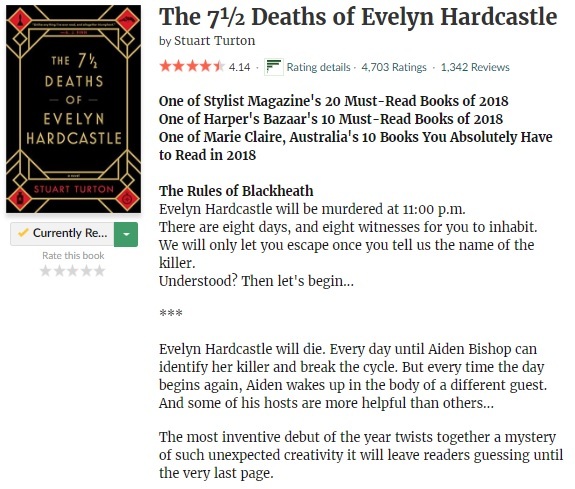 I’m currently buddy reading The 7 Deaths Of Evelyn Hardcastle by Stuart Turton with Nicki @ Secret Library and I definitely understand the love for this book now… WOW. This is definitely promising to be another full 5 star read to add to my short list of absolute favorites this year… Fingers crossed! I also picked up It’s Okay To Laugh (Crying Is Cool Too) by Nora McInerny Purmort, a memoir that is being compared to Jenny Lawson’s memoirs, but I’m just not feeling the humor yet. I definitely had a great time reading Misery, although it doesn’t feel the right word for a story this creepy. I liked the Misery chapters in between the actual plot, as it added another level and more dept to the plot itself. And I wouldn’t wish Annie upon my worst enemy! Boy, she is a true nutter… Writers, beware. She is stuff nightmares are made of. If you enjoy reading his work, Misery should definitely be on your reading list as well. Unfortunately Kids Of Appetite just wasn’t for me. I have seen this story has pretty extreme reactions, people either loving or strongly disliking it, so definitely don’t give up on it yet if you enjoy stories with unique characters and writing style. Because that’s the main struggle here: the writing. While unique and original, it is something that either works for you and makes you want to sing out loud, OR makes you want to throw things at the wall in frustration. Not that my singing would actually make anyone happy in the first place, but sadly my walls might have taken a hit or two here. If you enjoy detective thrillers and solving whodunits, Murder Map is a very entertaining addition to your reading list. While for me it lacked the little something extra to really make it stand out from other detective series, there is no doubt that the writing is strong, the plot twists are there and the killer is well disguised. The idea behind the plot is an interesting one as well! And the ending is a killer. 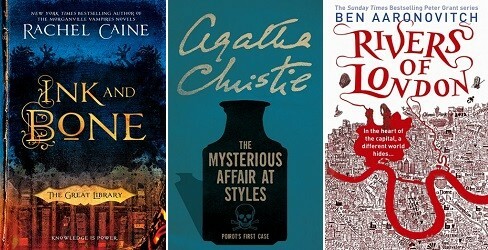 All in all not a bad start of a new detective series! This is the perfect book to use as a gift for anyone working in a bookshop or library, or any booklover in general for that matter! Fun, entertaining and full of weird situations that will make both your eyebrows raise and wonder what those customers were thinking when they opened the door to the bookshop that day… But at least it has given us this book to brighten up our day. Click’d wasn’t a bad read and I really liked the idea behind this story, but overall I found the story to be rather bland. The plot has that geeky feel with two of the main characters creating an app/game and the whole progress of coding and dealing with bugs in the code plays a big role throughout the story. The other main theme is friendship, which could work really well, but there were just too many cliches for me involved. I don’t mind a cliche or two, but if there are just too many piling up it starts to get annoying and less interesting. I’m trying to make a dent into my NG ARCs, so I need to pick up both The Confession by Jo Spain and The Echo Room by Parker Peevyhouse some time soon. And since I seem to be in the mood for lighter reads, I’ve put Britt-Marie Was Here by Fredrik Backman on the top of my TBR pile. He is easily one of my absolute favorite authors and I can’t wait to read more about Britt-Marie. My newest TBR jar pick is still An Officer And A Spy by Robert Harris. I’m still reading Run And Hide by Alan McDermott, which is proving to be a fast read so far. And since I was in the mood for some YA contemporary, I decided to start Kids Of Appetite by David Arnold. I adored Mosquitoland, so I’m having high hopes for this one! I’m also going to give Misery by Stephen King a second chance to see if I’m in the mood for it. And you might be surprised to no longer see Hunted by Meagan Spooner mentioned… I wasn’t in the mood for it and after picking it up and putting it down once too many I’m saving it for a different time. On its own, Broken Dolls has all the signs of a potentially explosive read. The disturbing plot, plot twists to spare, a lot of action, secrets and lies… It’s a tough case and world to dive into, but without doubt a recipe for an interesting story. Something stopped me from properly enjoying it though, and I don’t think it was the fact I haven’t been able to read the previous books. I’m having the feeling it has more to do with the writing style and tone, which just didn’t work for me and made it lot more difficult to keep reading. Is it simply another case of ‘not for me’ or is something more specific going on? I’m not sure, but the fact is that I wasn’t able to enjoy the story as I thought I would. 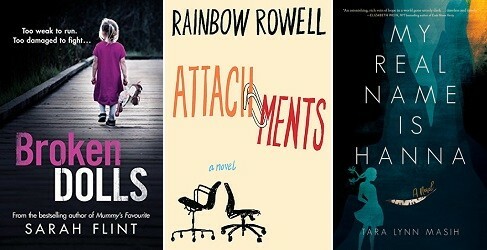 While this story has a lot of tropes that might make me potentially hate a story (insta-love, love triangle, geek cliche, musician cliche etc etc), I somehow ended up having a blast reading Attachments. Sure, there were a lot of cliches to deal with. Sure, things did get cheesy at points. Sure, there was a love triangle vibe going on. But somehow, if you are just looking for a light, fluffy and entertaining read, this story really works. Some serious editing issues aside, which I will forgive since it’s an ARC and not a finished edition, this story set in WWII Ukraine is absolutely wonderful. Though not based on a specific true story, both descriptions of the setting and the different characters make the story really come alive and it feels as if you are living the horrific experiences along with them. If you are a fan of good WWII survivor stories, this one is a must read. I’m trying to make a dent into my NG ARCs, and it’s time to finally pick up my copy of The 7 Deaths Of Evelyn Hardcastle by Stuart Turton. I’m a bit afraid because of the hype, but I just can’t resist any longer! I’m also supposed to pick up The Echo Room by Parker Peevyhouse some time soon. And since I seem to be in the mood for lighter reads, I’ve put Britt-Marie Was Here by Fredrik Backman on the top of my TBR pile. He is easily one of my absolute favorite authors and I can’t wait to read more about Britt-Marie. My newest TBR jar pick is still An Officer And A Spy by Robert Harris.